Control is all in the mind of the user. There are many different brands of control system available, from simple button only remote controls to touch screen displays capable of displaying media information, images from CCTV systems and other video sources. Control of any system is probably the most important aspect; if you cannot control your system you will never use it, but 5 or 6 remotes will still be on the coffee table . 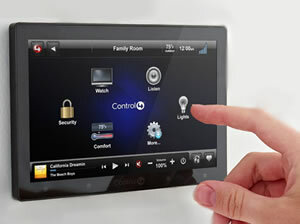 WebcentrikAV are fully trained and certified to program Control4, Nuvo and RTI remote controls. Often the most important factor when looking at a control system. With small children and a hard wooden floor it is often not prudent to use a touch panel remote, in this case less expensive remote controls are available that offer a similar level of functionality without visual feedback on the remote, often this use's an on screen interface such as that available with a Control4 system. Can the remote control operate all the equipment when hidden away in a cabinet, or from two rooms away? This will be addressed at the specification stage and the most suitable system chosen, every remote system we use will be able to control the system from a greater distance than required. Can you put the Sky remote in the drawer and leave it there? This is the acid test for any control system ; can you put all those old remotes away and just use your new system? We will ensure it is simple to use, fully explained on handover and should you require assistance we are always available to help over the phone. Can you add another remote or touch screen on to the system? All our remote control systems give flexibility to add additional remotes, touch screens, your own Smartphone or tablet as a handheld controller. WebcentrikAV will ensure whichever control system you choose, it will be programmed to make your life less complicated than it needs to be.